Ouray Hot Springs night shot, courtesy of DHM Design. Referred to as the “Switzerland of America,” Ouray, Colo., is a true gem of the Rocky Mountain Region. The town’s beloved hot springs facility serves the quaint one thousand person community as a recreation center, as well as a tourist destination that contributes greatly to the local economy. 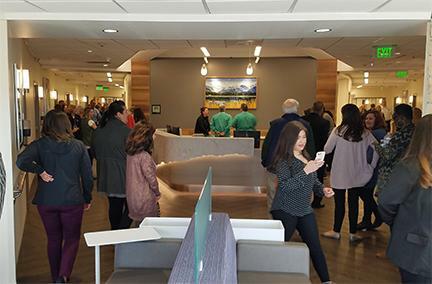 Last year, Colorado-based landscape architect DHM Design completed an award-winning renovation of the facility, focusing on an upgrade to the visitor experience.  The project received awards from both the Colorado Chapter of the American Society of Landscape Architects and Downtown Colorado Inc. in 2018. 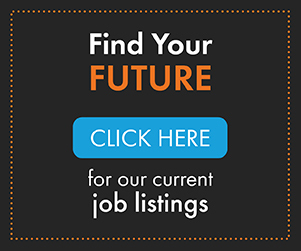 The project team consisted of DHM Design, Anderson Hallas Architects, FCI Constructors, Cloward H2O, Dowl, Russell Planning, 360 Engineering, AE Design, and Goff Engineering. Through collaboration, creative solutions and a comprehensive public process, the team rejuvenated this treasured amenity. The Ouray Hot Springs Pool was originally built in the 1920’s as a summer use facility. In the 1980’s, modifications were made to the pool that allowed the facility to be open year-round. Over the years, the patchwork of additions and remodels left gaps in the city’s ability to maintain and operate a facility that meets the expectations and needs of visitors. The whole facility includes an outside pool, two-story bath house and filtration/pump facilities. Reconfiguring the original oval shape of the pool into separate pools allowed the design to maintain the overall historic shape, while improving year-round function and maintenance. The three pools are now organized to create activity zones ranging from louder/active areas to traditional quiet soaking pools. Increased lawn and deck space create more spacious and scenic lounging/gathering areas and curvilinear pool shapes create more edge and deck space for better circulation. The new layout of the pool offers 360-degree views of the San Juan Mountains. 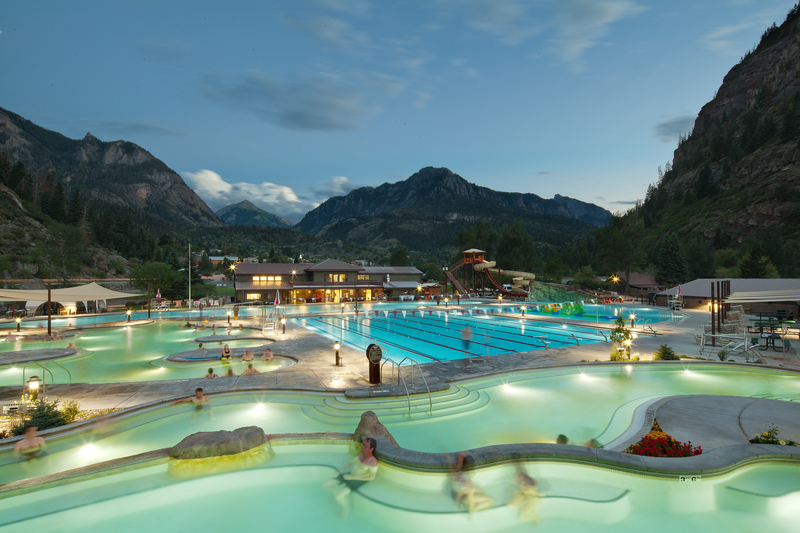 By developing additional edge space in the pool, more people can now sit along the edge with a view toward Ouray’s most distinguished peak – Mount Abrams. The pool’s new climbing wall reflects Ouray’s unique tourism draw for ice climbing. Other new features include a regulation lap pool, LED water lights to replace the bright over-hanging lights, shade sails, and new water slides. 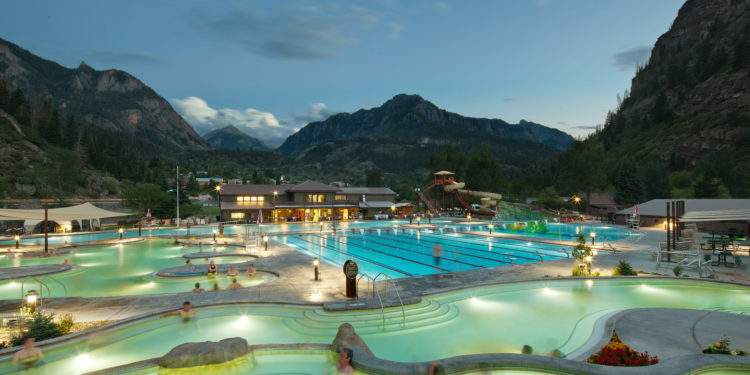 While many hot springs are private, the Ouray Hot Springs Pool is owned and operated by the City of Ouray. Public hot springs need to meet strict accessibility, community process and safety guidelines of a public infrastructure project. The community did not want to create a high end resort that would price people out of the pool, but rather an accessible, family oriented upgrade to the facility. The design met ADA Guidelines which include lifts, sloped entries, and transfer walls, which provide access for the soaking pools. The new layout also makes it easier for parents and lifeguards to observe and enter. The geothermal resources were engineered to heat 27,000 square feet of pools, using the latest technology to pull all the energy out of the natural water. The team utilized the existing pool shells as much as possible to limit the amount of material hauled off site. The multi-pool design also gives the city the option to close certain pools in the winter to preserve the geothermal heat. Maintenance staff are now also able to clean or repair one pool at a time without shutting down the entire recreation facility. 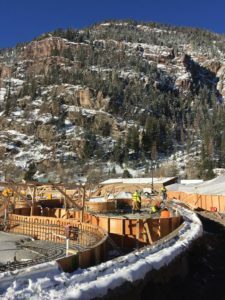 The Ouray Hot Springs is a significant driver for the local economy, which forced construction to be completed in their off season winter months. With unique construction limitations in regards to climate and the remote mountain location, the project required a high level of project management and quality control. DHM Design led the project, bringing a site planning perspective that was supported by the technical engineering team. The hot/mineral pools can now support more than 400 people – an economically significant increase from the former 80 person capacity. 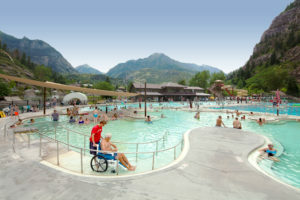 During the July 4th weekend after the facility reopened, almost 1,400 people came through the hot springs’ gates – nearly 50 percent more than the City of Ouray’s population. Ouray Hot Springs is part of a unique Historic Hot Springs Loop, which is promoted across the region as a tour of Colorado’s most impressive geothermal pools. Each of the 19 facilities offer different experiences, including Glenwood Hot Springs, where they are currently improving their facilities to include new family-friendly amenities designed by DHM and Cloward H2O and are scheduled to open to the public in 2019.